Owning a boat is not so much about buying your dream boat, but about creating one by customizing your boat to reflect your personality and style. There are almost endless upgrades you can make to add comfort, functionality or value to your prized marine vessel. A wide range of upgrade options and comprehensive advice on selecting the right ones for you can be found at Imagine Marine, a top marine supply store in Michigan. Not all upgrades must complex or require a huge investment either. Here we list three excellent, simple upgrades to help you get the best out of your boat and give it some new life. Are you relying on a separate portable device to listen to some music whilst you’re on the water? Getting your boat fitted out with proper stereo installation will have a big impact on your listening experience and add value to your boat. Premium entertainment systems can allow you to even set up and program different zones on your boat, to keep everyone happy. A speaker upgrade is an option to take an existing stereo system to a new level. Upgrading to a completely new stereo system will allow you to take advantage of modern technologies including Bluetooth connectivity. Many new stereos connect with your smartphone and make playing all your favorite tracks and working with your existing streaming services super easy. The importance of maintaining working and safe power systems on your boat should absolutely not be underestimated, and there are some easy upgrades which you can do. Adding a second or house battery and a selector switch will give you peace of mind when running your accessories, and is a back-up in the case of a dead engine battery. Another option is to purchase a portable generator. Whilst you are thinking about power; if your boat sits plugged in at a dock using shore power, then you need to be regularly checking your cables and accessories are in good condition and replacing or upgrading them as required. For corrosion protection, it is also critical to have a galvanic isolator installed. Specialist marine electronics products and accessories can be found at your local marine supply in Michigan, Imagine Marine. Installing some well-placed lighting on your boat can definitely give it a whole new feel and add some dramatic style. LED lighting is perfect for use on boats as it operates on 12V systems and requires very low power to run, but provides great illumination. 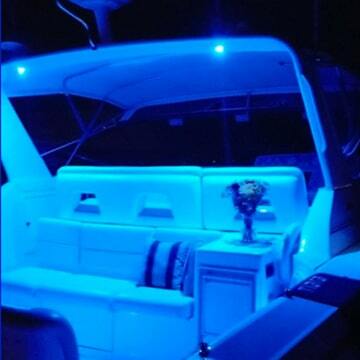 LED strip lighting is an excellent and easy way to transform your interior boat ambiance. Some systems offer you control over the lighting color as well, so you always can adjust the mood to suit your needs. A huge variety of other shapes and sizes are also available to light everything from your boat stairs to your shelving, and coves. Or, anywhere your heart could desire. Underwater lighting is not a necessity for most boats, but certainly makes an impressive upgrade to a boat exterior. As well as its obvious aesthetic appeal, it is useful for night fishing and also a good safety item in the event of a man overboard. Many lights have color control, and strobing. Underwater lighting models are available for various budgets, and you can definitely go all out on them. However, there are some very simple lighting options available starting at reasonable prices. There are also great LED flood lights available.